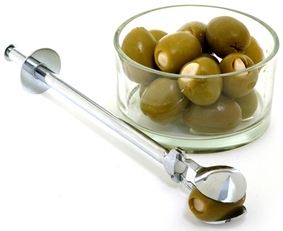 Our stainless steel olive tongs will compliment any cocktail party or vegetable tray! It has a scoop-like end that makes it easy to grab olives, pickles, cocktail onions, or maraschino cherries. These tongs also have a specially designed handle to reach into jars and an innovative push-to-grab tip.